Reading is to map orthographic units onto an existing phonologic-semantic system of its corresponding spoken language. Neuroimaging studies have shown that the print-speech co-activation in perisylvian networks for print-speech conversion is a universal neural signature of skilled readers. In addition to large commonality, small language differences are suggested: phonological knowledge from spoken language is useful for orthographic learning in transparent writing systems whereas visuospatial processing is more demanded for opaque writing systems, like Chinese. An emerging research suggests that reading acquisition may also reflect a general statistical learning (SL) capacity to implicitly assimilate the systematic structures of a linguistic environment. It is unclear whether visual and auditory SL play similar roles in learning to read different writing systems and whether the experience of learning of any given orthographic system changes the way one detects and computes statistical patterns. To understand the bidirectional relations between SL and reading experience, future research could examine the relative contribution of visual and auditory SL to individual differences in learning different writing systems, e.g., English vs. Chinese and track the changes of SL after learning different writing systems. 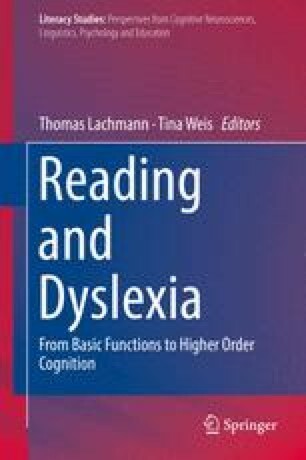 Such studies will also shed light on the debate in universal account of learning difficulty in dyslexia.